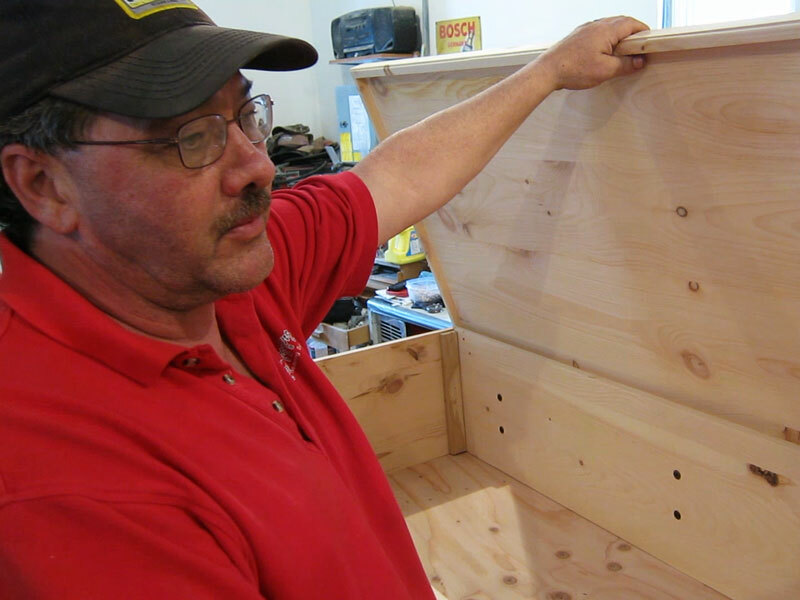 Tad Hoskins bought a DIY casket kit for his mother. Tad Hoskins thinks we should face the facts: We’re all going to die. So we should make the necessary preparations. He’s not a morbid guy — just well prepared. That’s why he has his mom’s casket stored in his workshop. Spring came late this year to New York Mills, Minnesota. When we visited in April they were having yet another snowstorm, and the ice was still thick on the lakes. In the summertime, the area is teeming with people from Minneapolis. It’s about a three-hour drive. They stay at cabins and resorts and campgrounds. Only about a thousand people live in the town year-round, and a lot of them work at the big Lund fishing boat factory. Clear over on the other end of town—six blocks away—Patrick Kilby has a shop. He spends most of his year here, but he lives in Manhattan for two months each winter so he can play Santa Claus at Radio City Music Hall. “It’s called the Christmas Spectacular with the Rockettes,” he says. Kilby definitely looks the Santa part. He has the hair, the beard, the physique and the little round glasses. But instead of making toys for the rest of the year, Patrick Kilby builds and refinishes furniture. He makes a few dozen caskets each year. Some people buy them already assembled, and some people buy a casket kit. The phrase “simple pine box” doesn’t quite do this casket justice. “I would call that a rough box,” he says with a grin. Patrick Kilby’s caskets are smooth, tightly-fitted rectangular boxes. The lids have beveled edges and there’s a sturdy handle running down each side for the pallbearers to hold onto. Each kit comes with an Allen wrench. That’s the only tool that’s needed to put the casket together. In fact, if you called this casket something like The Norqvist, you could almost imagine it in an IKEA catalog. “Right now, it’s unfinished,” Kilby says. Some people put a coat of finish on the casket. Some don’t. 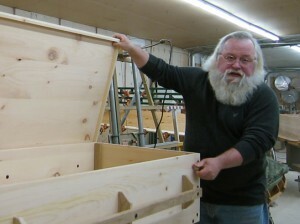 Patrick Kilby made his first casket about eight years ago. That one was for his mother. She was dying of cancer, so Kilby and his siblings had started to make preparations. “We went and started doing some shopping and trying to figure out, what does this cost?” Kilby says. They were looking at caskets that ranged in price from $3,500 to roughly $10,000. “What was available to buy just didn’t seem like it fit somehow,” Kilby says. Then Kilby’s sister had an idea. At first, Kilby says, the idea seemed pretty weird. But he agreed to do it. When he finished making his mom’s casket, he and his wife put it in the back of their pickup truck. They covered it with a tarp and drove to his sister’s house down in Minneapolis. His sister lived on a busy commercial street called Lyndale Avenue. That’s when Kilby discovered that some people are freaked out by caskets. Kilby and his wife thought that was an odd response. But Kilby figured there must be some people who are comfortable thinking about death and looking for ways to prepare for it. So he decided to make some more caskets. Kilby says the other group consists of people with parents in their 90s. “They will buy kits from us and say, ‘We’ll just keep these, store these, and when we need one, we got it,’” he says. That’s what will happen the casket that Kilby is working on today. He ships casket kits all over the country, but this particular customer lives only 60 miles down the road, so Kilby will deliver the kit in person. The customer, Tad Hoskins, lives outside the town of Brainerd. That’s where the police chief in the movie “Fargo” lives. When Kilby arrives, Hoskins is outside his big, multi-vehicle garage tending some habanero beef jerky in his smoker. “OK, you want to haul it in?” Kilby asks. He has this casket pre-assembled so Hoskins can get a look at it. The two of them slide it out of Kilby’s van and carry it into the garage. They set it on a couple of sawhorses. A while back, Hoskins saw one of Kilby’s brochures, and he decided to make a casket for his mom. He’s a carpenter, but he doesn’t have the tools for woodworking. So he decided to buy one of Kilby’s kits. Hoskins says he and his brother might work on the casket together. Hoskins’ mom is 80 years old. She’s still living at home with some help from her daughter, but she’s been talking with hospice people lately. She’s also been leaning on Hoskins to get a casket for her. Hoskins thinks his mom will be pleased. Tad Hoskins says he’s always had a matter-of-fact attitude toward death. He thinks it might be partly because he grew up in a farming and hunting family and he saw a lot of death. Hoskins grew up with this understanding as well. The first person Hoskins lost was his grandpa. Hoskins is 53, but he and his wife are already making plans for their own deaths. They will be cremated, and they’re commissioning Patrick Kilby to make wooden urns for their ashes. They’ll be kits, just like his mom’s casket. Hoskins says they’re making the decisions now for the sake of their kids. His father died unexpectedly of a stroke more than 20 years ago, and he remembers having to make a lot of tough decisions in a hurry. Hoskins says he, his wife and his mom are all alike in this regard. Caught part of this podcast while making the short drive home from a visit to a friend. Until I heard the town Brainerd mentioned, I thought it might be about the man who sold my father the plans for a simple pine casket 20-some years ago. It wasn’t; that order came from California. But I was struck by the similarities in the stories. Dad was sitting at his desk one day at the back of the house when his mother, my Grandma Etta, came in and dropped a newspaper in front of him. She insisted he look at an ad. It was offering woodworking plans for a simple pine casket. Grandma–no where near death–insisted he order one right away and build it for her. Once Dad realized she was serious, he ordered the plans and built the casket–which look very similar to Mr. Kilby’s. My aunt did the upholstery. When it was finished, Grandma wouldn’t hear of putting it into storage. She had them put it in her living room, where she referred to it as her “coffin table,” and at Christmas she laid out on that casket her gifts of homemade candy for which she was well known. Grandma lived to be 96 years old. In 2012, she passed away and was buried in the casket built for her by loving, if somewhat bemused, hands. Incidentally, while preparing to comply with Grandma’s request, Dad did a little research and discovered that not all cemeteries will readily accept the burial of a loved one in a casket made by hand. We were relieved that the small town where I grew up and where Grandma lived was willing to let us do this. Grandma Etta was buried in exactly the unpretentious, simple pine box she wanted–formerly a coffin table. web site style is ideal, the articles is in point of fact excellent : D.